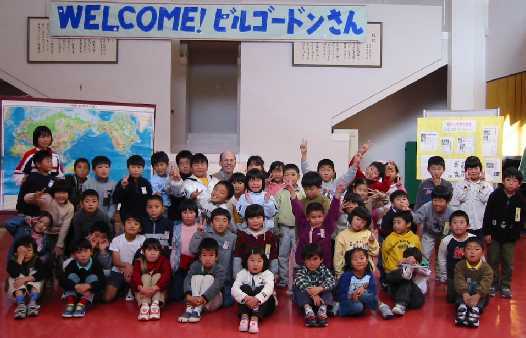 The welcome by the students at Monou Elementary School really surprised me. When I arrived by car, I could see a huge sign saying "Welcome! Bill Gordon," which was hanging from the second floor of the building. The fifth-grade students were lined up outside holding American flags. I went down the line shaking each of their hands, and then on the front steps of the building the students presented me with a gift of art work and calligraphy made by several of the students. 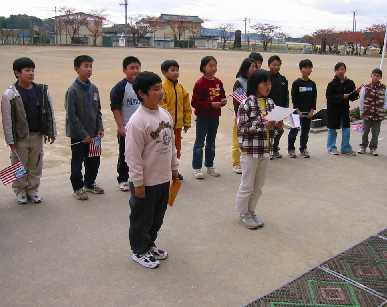 Monou Elementary School, established in 1873, has about 200 students. Each of the school's classes got involved in some way during my three-hour visit to the school. 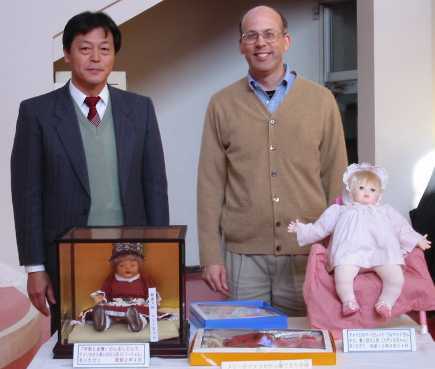 The school had prepared for my visit a well-designed brochure, which contained much information about its original Blue-eyed Doll received in 1927 and its new doll received in 2000. After a brief stop in the principal's office, I was escorted to the gymnasium. 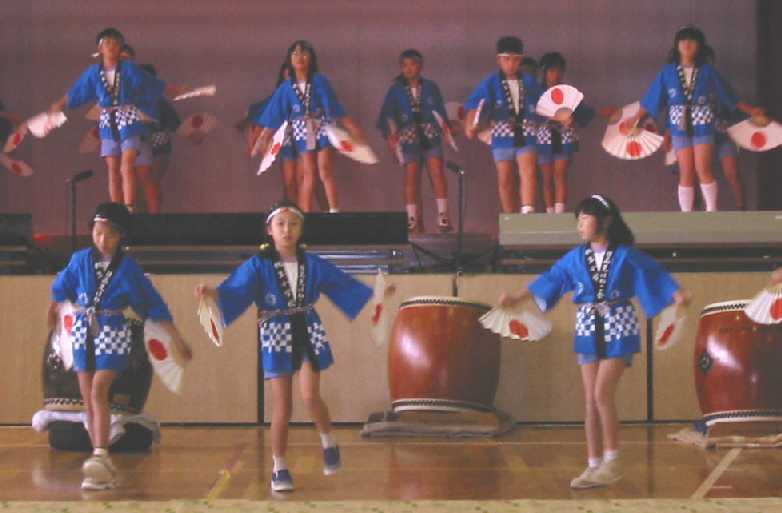 The third-grade students did an energetic taiko drum performance (see photo below). Next, the fourth-grade students performed a beautiful Japanese traditional dance (see photo below). I went to talk with the enthusiastic first and second graders after a quick lunch with the sixth-grade students. I began with a presentation about the Friendship Dolls and the United States. When I asked whether the children had any questions, I was amazed when over half of them raised their hands, eager to ask questions. The children had so many questions that time ran out before I could answer all of them. The children had many interesting questions, including several about the Friendship Dolls exchanged between America and Japan in 1927. When they found out that their school's doll is 74 years old, they seemed to think I was quite young at 44. One boy asked why the dolls have blue eyes, and the students were surprised to look at my eyes and see a blue color. I explained that although many Americans have blue eyes, the United States has many different kinds of people living together with different eye colors. Also, several of the "Blue-eyed Dolls" had eyes other than blue. Two or three students had detailed questions about the Blue-eyed Dolls that I could not answer, so Ms. Shizukuishi, an active member of the Miyagi Blue-eyed Doll Study Group, kindly helped me by answering them. She answered questions about the sizes of the Blue-eyed Dolls, the existence of boy dolls, and the dolls in Miyagi Prefecture. After finding out that there were some boy Blue-eyed Dolls, we had some discussion about why there were not more boy dolls. I gave my opinion that probably more girls than boys preferred dolls, since I always preferred baseball rather than dolls. Many of the boys raised their hands when I asked the children whether they liked baseball. When I asked the girls how many liked dolls, almost all of them indicated they did, but when I asked the boys the same question, only five or so said they did. Monou Elementary School's two dolls, along with related newspaper articles and other items, are displayed in a glass case at the front entrance of the school building. Their new doll, Suzanne, sits next to their original doll, Mary. Suzanne was a special present given in 2000 by Margaret Corbet, the owner of Miss Miyagi, the Japanese Friendship Doll sent to America in 1927. I was glad to see that the school appreciated its new doll just as much as the doll given by American children over 70 years ago.